In 2014, Pinterest isn’t just for foodies, fashionistas, and DIYers; it’s a place small businesses – especially retailers – should know and love. Sure, your company’s social media efforts might already include Facebook and Twitter, but Pinterest is the ideal marketplace for buyers. Purchases are just a few clicks away. In fact, “the average order placed by Pinterest shoppers is $169, the average from Facebook is $95 and the average from Twitter is $70” (RichRelevance). One business taking advantage of Pinterest’s powerful potential is Nordstrom. This high end department store has over 4.4 million followers, making it the most followed brand on Pinterest (as of October 2013). They are doing a lot of things right: staying active, creating specialty boards full of “Rich Pins” with real time prices and direct links to their ecommerce website, and having a social media sharing widget on their ecommerce site, allowing online shoppers to “pin” any product to their own Pinterest board. Nordstrom is building unique boards of their products with their customers’ interests in mind – from Shoe Lust to How-to and DIY to Fashion Cats to Beach Wedding Ideas. Furthermore, they’re telling stories rather than just selling – see their board SJP: A Day in Her Shoes, which has posts by Sarah Jessica Parker, ranging from shoes to dresses to ticket information for the NYC Ballet. People buy with their eyes before their minds. In the world of ecommerce, striking visuals speak so much louder than words, sales banners, or reviews. If you have taken the time to include professional product images on your website, you can put those pre-existing visuals to work on a larger scale. Since its launch date in March of 2010, Pinterest has gained over 70 million users (TheNextWeb). That’s a pretty big audience to ignore. Pinterest drives more referral traffic than YouTube, Google+ and LinkedIn combined (The Huffington Post). Pinterest isn’t just about speaking with a meticulously assembled audience. It’s a social media platform built upon sharing. Good posts or “pins” do the work for you, spreading among multiple pinners and multiple boards – all driving traffic to your site. 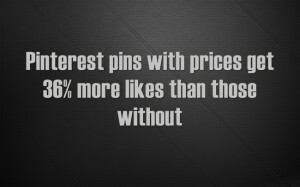 With Rich Pins, Pinterest users can see real time prices and inventories, and they can even be emailed when prices drop. Yes, this is a social media platform you can leverage into an email marketing campaign with a direct call-to-action. An added bonus is a trending products widget that collects Pinterest data for retailers to integrate into their own website. Target, for example, is already having success in this area with its “Awesome Shop,” a collection of its most pinned items in one area of their online store. There are so many ways small businesses can use Pinterest: integrating “Pin-it” buttons on website images, using the Article Pin feature to post additional information about blogs, becoming active on established authorities’ guests boards to make yourself better known, and so much more. As of December 2013, Pinterest is the third most popular social network, overtaking Twitter to follow behind only Facebook and LinkedIn according to recent Pew Research. Pinterest may be relatively young compared to some of the other social media giants, but it’s growth spurt shows a lot of promise. Don’t let your online store suffer by ignoring perhaps one of the most powerful social outlets in the ecommerce space.